Explore the Pista Ciclabile by bike or on foot. Embark on a great family day out and explore the route from San Lorenzo to San Remo. the path is only accessible for pedestrians and cyclists. The cycle path was constructed on top of former train tracks, which have been redeveloped and asphalted by the state-owned company Area 24. The route between San Remo and Ospedaletti was completed in April 2014 and a further development of the route to Imperia is planned. Enjoy the ride and the swim! The road is flat and leads through many little towns along the picturesque Mediterranean coast of the Riviera Ponente. During the cycle tour, you will experience the enchanting landscape of Liguria up close. Cycle along the sea, undisturbed by the traffic on the parallel Via Aurelia. There a numerous cyclehires, resting places, benches, water fountains and playgrounds enroute. 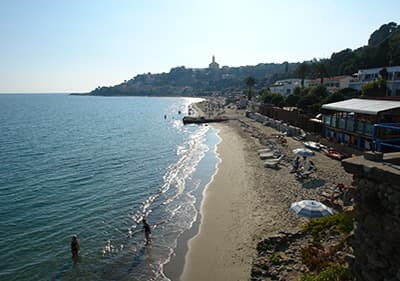 The beaches, for instance around San Lorenzo al Mare and San Remo, are also easy to reach from the Pista Ciclabile. The route is suitable for families and inexperienced cyclists. Apart from bicycles, the hire office “Nolo-Bici” also hires out tandems, tri-cycles, rickshaws, inline-skates, skateboards and a variety of accessories. At a leisurely pace, the journey from San Lorenzo to San Remo takes around 1.5 hours. Along the Pista Ciclabile, there are several offices of the cycle hire “Nolo-Bici”. The hire office offers several rates: per hour, per 2 hours, per day or half a day. You can hire your bike in person, or book it in advance. 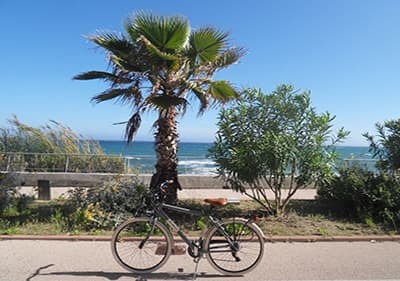 To allow you a completely relaxed start to your cycle route along the coast of Liguria, we present a few starting points, where you are able to park and are within easy reach of the cycle hire. 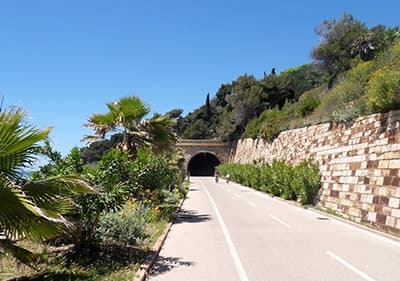 To allow you a completely relaxed start to your cycle route along the coast of Liguria, we present a few starting points, where you are able to park and are within easy reach of the cycle hire. The route starts in the town centre of San Lorenzo al Mare. 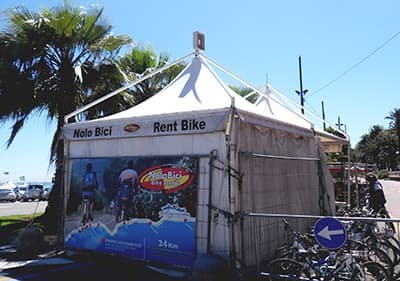 The cycle hire “Nolo—Bici” is situated directly on the car park and right next to it, the tour towards San Remo starts. Now follow the signage for Pista Ciclabile and you will reach the car parks. The cycle hire Nolo- Bici is on the car park behind the barrier. Here you can simply hire your bicycle and get started! After only a few meters, there is a small playground on the left hand side, as well as a bar that sells Paninis and drinks. If you carry on, you will reach a tunnel of about 1.5 km length that takes you from San Lorenzo al Mare to the village of Piani. The tunnel is lit and refreshingly cool on hot days. On foot, it takes around 20 minutes and by bike around 5 minutes to reach the other side of the tunnel. Beyond the tunnel, there is a relaxing zone with benches, a water fountain and an SOS switch. Here, you can enjoy the view to the sea and recover, before continuing towards Santo Stefano al Mare. Drive towards San Remo/Ventimiglia. In Santo Stefano, take a sharp left at the junction with traffic lights before the Esso service station into the Via Cardinal Meglia. Drive towards Genua. In Santo Stefano, take a right after the Esso service station into the Via Cardinal Meglia. Follow the road. On the right hand side, you will be able to see the cycle hire Nolo-Bici. Drive through the tunnel and turn right inside the tunnel. At the roundabout, turn right (first exit). Park in the parking places on the left hand side that are marked white. 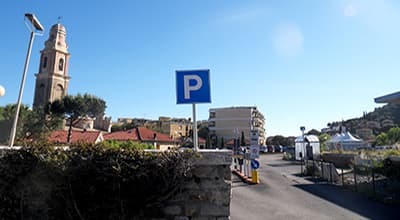 The access to the Pista Ciclabile is opposite the parking places/ beach promenade: about 20 m from the roundabout, an uphill path passes between the houses. 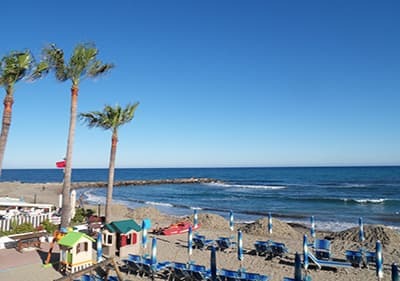 If you don’t wish to cycle the entire length of the Pista Ciclabile, you can, for instance, choose the town of Santo Stefano al Mare as your starting point and cycle from here to San Remo or towards San Lorenzo al Mare. In Santo Stefano al Mare, you will arrive at the resting place Scala 4, which sits right next to the cycle hire Nolo-Bici. If you continue, you will pass the harbour “Marina degli Aregai. If you wish to visit it, you will find several bars and shopping opportunities alongside the boats and yachts. At the end of the village of Riva Ligure, you will get to a junction with traffic lights. You can take this opportunity to take a look at the village. From Riva Ligure, you continue towards San Remo. You pass through the villages of Arma di Taggia and Bussana. The Pista Ciclabile always follows the sea. Enjoy the beautiful view of the coast of Liguria. Take the coastal road SS1 to San Remo. In San Remo, you will pass the Villa Nobel. After this, take the 4th exit at the roundabout to remain on the SS1. Turn right to continue on the SS1. After approx. 2 km, turn left into the “Lungomare Imperatrice” and follow the signs for the car park. Take the coastal road SS1 to San Remo. 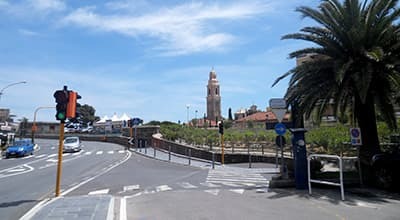 In San Remo, turn right into the “Lungomare Imperatrice”. Hereafter, turn right towards Lungomare Vittorio Emanuele II. and follow the signs towards the car park. The Pista Ciclabile also leads to the beautiful coastal town of San Remo. As a starting point, you could for instance choose the Blue Bird Café. Park here and walk to the end of the car park. On the right, you will see the cycle path and the Blue Bird Café. Here, you can hire your bike and enjoy a snack at the same time. Tag along for a bike ride combined with swimming trip and refresh yourself in the cool sea water. We have selected the best resorts for you. Wide white sand beach, fine sand. Beach cleaning service, changing rooms, toilets, showers, hammocks and parasols on-site. A snack bar and restaurant will ensure your physical comfort. Free and pay beaches. The sand is very fine and the semi-circular shape of the beach offers a unique view to the mountains from Bussana to Aregai di Cipressa. A great choice for families. Numerous beaches, both free and subject to a charge, offer great bathing experiences to younger and older guests. Stunning sand beaches and easily accessible beach sections with shallow waters are a particularly good choice for families. Bars and restaurants cater for your physical comforts. 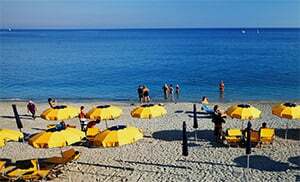 The beach “Tre Ponti” in San Remo is well known amongst the younger generation. The beaches towards the East lend themselves to wind surfing. A beautiful sand beach stretches all the way from Portosole to Porto Vecchio. Pista Ciclabile: Levanto - Framura Levanto is also called the gate to Cinque Terre and is regarded as a secret tip for beach goers. All cycling fans have a reason to rejoice because there is a Pista Ciclabile here too. A few years ago a railway line between Levanto and Framura was also converted into a wonderful track specifically for cyclists, pedestrians, and inline skaters. Cars are not allowed on this track. In 2010 an asphalted road was constructed there, and it runs directly along the sea between illuminated tunnels and and wide, open bays. Whoever feels the sun is too warm for his/her liking, can take refuge in the shady tunnel. However, there is nothing wrong with having a light on the bicycle for the somewhat darker places along the way. The stretch is approx. 6 km long, it is a secure place and is very much frequented by tourists and local inhabitants too year after year. The interplay between light and shade, as well as the breathtaking view over the sea makes the cycling tour an ever wonderful experience. Whether you are alone or two, or you are with the whole family, the Pista Ciclabile from Levanto via Benassola to Framura is very suitable as an optimal excursion. The road is flat and very good to ride on. If the cycling becomes too tedious, you can now and then stop at the small bathing places along the way to cool yourself down and at the beach bars for some refreshment. The actual duration of the tour is approx. 1 hour on foot and almost 30 minutes by bicycle. Once you have reached Banassola and you feel you have not yet had enough, you can get a wonderful experience by taking the hiking path from Banassola to Framura through the lonely rocky and forest landscape.